Celtic opened their new 2,900-capacity safe standing section in their first home game under Brendan Rodgers. 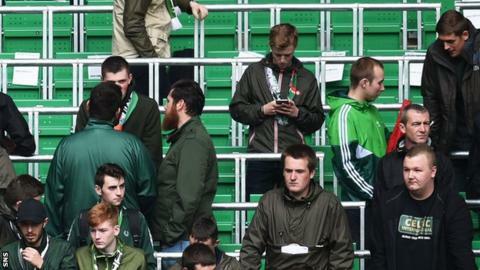 Rail seating has been installed in the north-east corner of Celtic Park and fans populated the area for Saturday's 2-1 friendly win over Wolfsburg. The Scottish champions were granted a safe-standing licence in June last year by Glasgow City Council. "This is another step in the redevelopment of Celtic Park," said the club. "This is an exciting development for fans reared on the songs and stories from the old Celtic Park and the iconic Jungle. But it's also a major step forward in improving the safety and security of supporters." Scotland is not bound by the law that banned standing areas in the top two divisions in England in 1994, following the Hillsborough disaster in 1989. The issue about whether to allow some standing areas has been revisited since then. Prior to the merger of the Scottish Premier League with the Scottish Football League to form the Scottish Professional Football League in 2013, top-flight clubs were given the all clear to have safe-standing areas within their stadiums. In Saturday's friendly, Paul Seguin gave visitors Wolfsburg the lead with a deflected shot. However, Callum McGregor equalised with a fine finish before Ryan Christie showed neat footwork to net the second-half winner. Danish defender Erik Sviatchenko went off with a head injury in the first half for Celtic, who trail Lincoln Red Imps 1-0 going into Wednesday's Champions League second qualifying round second leg in Glasgow.